ATLANTA (March 17, 2016) – Oregon’s first stand-alone Chick-fil-A® restaurant will open March 31 in the Tanasbourne area of Hillsboro, bringing the restaurant’s signature menu of fresh, hand-crafted food, award-winning customer service and more than 80 jobs to the state. The restaurant, formally named Chick-fil-A at Tanasbourne, is located at 2855 NW Town Center Drive and will be locally owned and operated by Hillsboro resident Brian Hogan. Hogan is a fifth generation Oregonian and recently returned to the Hillsboro area with his wife, Jaclyn, to open the franchise just three miles down the road from his childhood home on Hennig Street. He is a long-time Chick-fil-A team member, having started with the company at age 16. 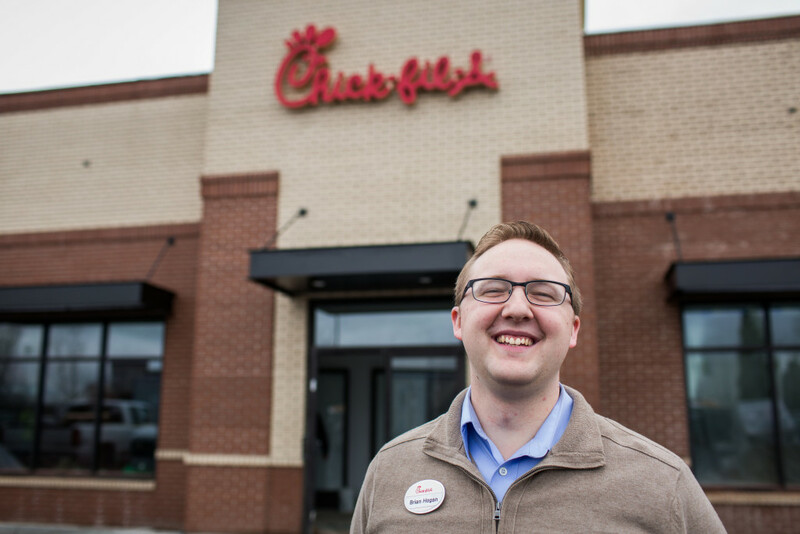 After building his career with Chick-fil-A, he is excited to return to his hometown to open Oregon’s first Chick-fil-A restaurant. He will oversee day-to-day activities of the restaurant, employing more than 80 full- and part-time team members, cultivating relationships with Hillsboro schools, organizations and neighboring businesses, and serving local guests. The grand opening celebration includes the chance for 100 adults to win free Chick-fil-A meals for a year. Community members will also have the opportunity to donate books to benefit Hillsboro-area youth. After 12 years and nearly $24 million in free food given away, Chick-fil-A’s “First 100” celebration is the restaurant company’s signature grand opening event, which transforms the restaurant parking lot into a 24-hour community friendly party as the crowd awaits the opening. The Tanasbourne First 100 event will award more than $32,000 in free food. A digital offer card loaded with a one-year supply of free Chick-fil-A Meals will be given to each of the first 100 eligible adults, ages 18 and older with identification, in line when the doors open at 6 a.m. on Thursday, March 31. If more than 100 people are onsite when the line officially forms at 6 a.m. on Wednesday, March 30, then all 100 spots will be determined by a drawing held that morning with those selected needing to camp out for 24 hours to secure their spot. This community event is only open to guests residing in specific zip codes within a 68-mile radius surrounding the restaurant. A complete listing of eligible zip codes and rules can be found on the Chick-fil-A First 100 Promotion website. To celebrate the new Chick-fil-A restaurant and the Hillsboro community, Hogan is collecting new children’s books to benefit Tobias Elementary School – the school he attended as a child. The community is invited to bring children’s books to the restaurant from Tuesday, March 29, through Saturday, April 2, to be placed in a Book House, donated by the Chick-fil-A Foundation. The nearly three-foot Book House, created entirely from reclaimed wood, will then be donated to serve local youth. With dining room seating for 146 guests, the new restaurant also includes drive-thru service for customers on the go. The interior features the chain’s latest design, which incorporates subway tile and metals in a variety of finishes and patinas all complimented by an abundance of windows. The vintage-inspired interior includes other unique custom features such as light fixtures made from recycled Coca-Cola bottles and peach baskets. Chick-fil-A at Tanasbourne is one of more than 90 new restaurants the chain plans to open across the country in 2016, creating more than 8,000 new jobs. For more information about the Chick-fil-A at Tanasbourne, as well stories about team members, the community and more, visit PortlandCFA.com or “Like” us on Facebook at facebook.com/cfatanasbourne. Interested applicants can apply at jobs.portlandcfa.com. Chick-fil-A, which in 2015 was ranked the No. 1 quick-service restaurant for customer service by the American Customer Satisfaction Index, is known for its menu of fresh, hand-crafted food and offers a variety of options for guests of all ages. Signature items include a hand-breaded, boneless chicken breast sandwich, Waffle Potato Fries and hand-spun milkshakes. The restaurant uses only premium ingredients and makes many of its menu items from scratch in the restaurant each day, including hand-chopped salads and fruit. Chick-fil-A at Tanasbourne will partner with regional farmers and suppliers to source as many locally and regionally grown ingredients as possible. In fact, the restaurant will source all of its bread from Portland-based Franz Bakery, which also supplies bread to Chick-fil-A restaurants in Washington. Chick-fil-A sources all potatoes used to make hash browns and Waffle Potato Fries from the Columbia River Basin – buying more than 438 million pounds of potatoes last year alone. Additionally, all of the apples used to supply Chick-fil-A's West Region restaurants are grown in the Pacific Northwest, sourcing more than 2.25 million pounds of apples from the region each year. Chick-fil-A is also collaborating with national and regional poultry suppliers to ensure it serves chicken raised without antibiotics in all its restaurants nationwide by 2019. Atlanta-based Chick-fil-A, Inc. is a family owned and privately held restaurant company founded in 1946 by S. Truett Cathy. Devoted to serving the local communities in which its franchised restaurants operate, and known for its original chicken sandwich, Chick-fil-A serves freshly prepared food in more than 1,900 restaurants in 42 states and Washington, D.C.